Microwave Deepavali & Post-natal Lehiyam using Readymix Powder is a quick and easy method to prepare lehiyam for those who are beginners and for those who stay abroad where getting all the ingredients is tough. This can be used for treatment of digestion and cold related problems also. The powder can be purchased well in advance and can be kept in freezer up to 1 year. I had purchased this in Chennai “Dabba Chetty Stores” and “Lalitha Pharmacy” in mylapore near Kapaleeshwarer temple. Powders purchased in both these shops can be freezed upto 1 year, however you need to transfer these powders to a proper zip lock. This recipe is ideal for post natal diet also. Adjust the amount of jaggery based on your needs. Addition of honey is optional, however I have not added in my video. 1. 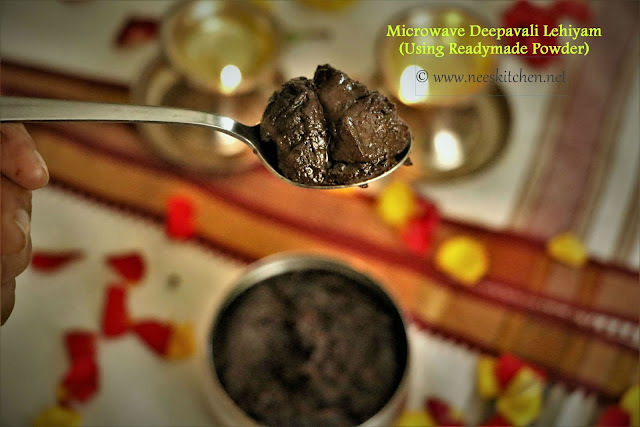 To begin making the ‘Microwave Deepavali & Post-natal Lehiyam using Readymix Powder’ boil 1.5 cups of water in gas stove. Water cannot be boiled in microwave. 2. Once the water is boiled, switch off the gas and mix grated jaggery and dilute it. Filter the jaggery water and remove the impurities. The water must be still hot when filtering hence do this step immediately after diluting. 3. Take a microwave safe bowl (ceramic or glass only) and add the jaggery water and readymix lehiyam powder. Mix it well without any lumps. 4. Add 1 tsp of ghee and 1 tsp of oil to this mix and microwave high for 2 minutes. 5. After 2 minutes take out and mix once. Again add 1 tsp of ghee and 1 tsp of oil. Repeat this up to 6 minutes (3 Times). By the end of 6th minute oil starts to separate and a layer of oil and ghee can be seen on the dish. 6. Microwave high for 11 minutes. Inbetween every 2 minutes take out and mix once. 7. At the end of 11th minute the mix would be like a thick yet slightly loose consistency (Refer Video). You may wish to add 1 tsp honey at this stage. 8. Take out and leave it aside for 5 minutes. Do not skip this step as this would make the lehiyam to the right consistency. 1. Water cannot be boiled in microwave. 2. 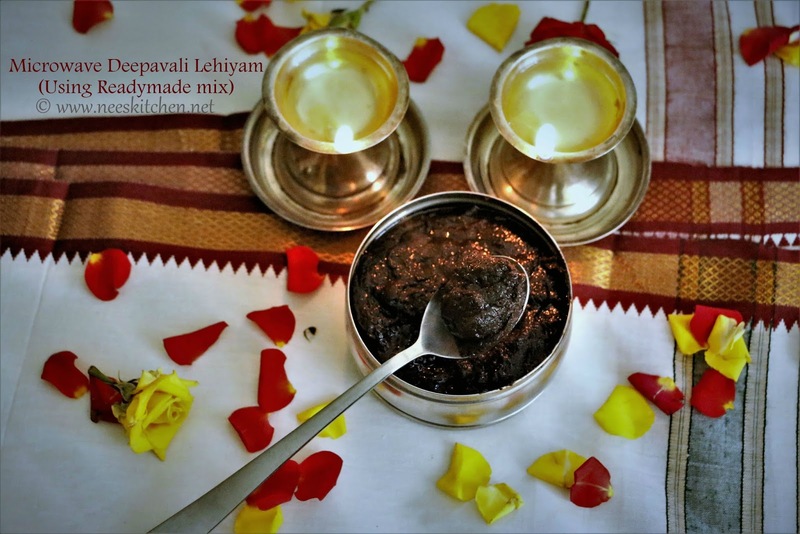 The lehiyam powder must first be mixed in the hot jaggery water. If the water is not it becomes difficult to mix without lumps. 3. Addition of honey is optional.